An island in the sea is struck by a massive catastrophe. Years later its inhabitants, anthropomorphic animal characters, are making a bleak living by scrounging for copper amidst the wreckage of once powerful industrial might. Dinky and her friends, Sandra and Little Fox, want to run away, leave the island and find a better life. She also wants to persuade Birdboy, who lives on his own in the lighthouse by the sea, to come away with her. Birdboy has his own personal demons which he has to deal with, literally and metaphorically. Still haunted by the death of his father he is continuously hunted by the local police officer and his protege. Birdboy is the loner in this story, misunderstood by most on the island. It does not help him that he has to take drugs to subdue the demon living inside him, and he rarely talks. His ability to fly and Dinky’s love lift up Birdboy beyond his disdained life. It may seem that this adaptation of Alberto Vázquez’s graphic novel Psiconautas is so dark, forbidding and full of misery that it will endlessly punish its audience for the seventy plus minute run time. Thankfully there are bits of humor woven into the narrative to alleviate the tension that builds up in our collective chests. Vázquez and Co-director Pedro Rivero are wise instill these moments of wonder and humor within the horror of the lives of their characters. The imagery will get darker and drearier as Psychonauts progresses until the full fury of the demon inside Birdboy is unleashed and as Dinky and her friends come across the titular Forgotten Children on their way to the shores. It is a harrowing climax to the film indeed, but one that still ends with some hope after the unholy flames have died down. As the bulk of animation industry is driven by clicks of the mouse and whines of hard drives it is always refreshing to watch an animation that was drawn by hand. It is no small feat that Psychonauts was completed by a small team of slightly more than half a dozen animators. As the heart and soul of this island’s inhabitants has been ripped and laid to waste so have the animators left of of all theirs on the screen. The tremendous visuals are paired with a great score. Then there is some terrific sound work in the climax that brings Birdboy's inner demon to terrifying life, rivaled only by its predecessors in the Japanese Kaiju genre. It is a magnificent achievement in animation to have something that looks so raw around edges convey so much emotion, wonder and terror. 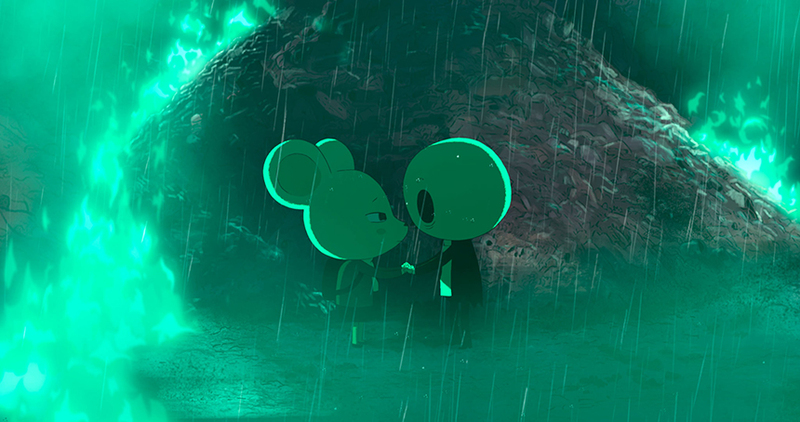 If a haunting pleasure is something that you are looking for, an animation that challenges visually and literally, then seek out Psychonauts, The Forgotten Children.